Unhappy with its partners in the EU, Russia turns both east and west in its search for closer cooperation. 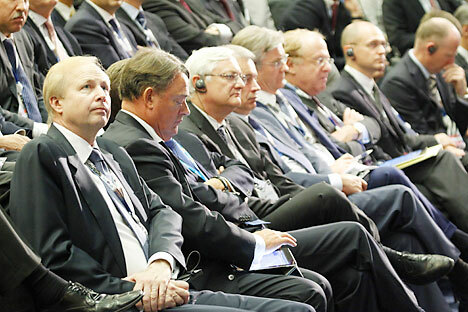 Thousands of top executives from the international business community joined political leaders in Russia's imperial capital in the middle of June for the annual Kremlin-sponsored St. Petersburg International Economic Forum. The results of the forum underlined the Kremlin's main foreign policy initiative – promoting a multi-polar world – and the EU should be disappointed with its low profile at the meeting in terms of initiatives and deals. The plaintive remarks from Bob Dudley, CEO of British oil major BP were typical. Dudley told delegates that his company’s failed deal to explore the Arctic with Russia’s state-owned Rosneft, "was in everyone's interests" at about the same time Rosneft announced that it will find another partner. Overall, one of the big messages coming out of the meeting was that Russia is disappointed with Europe and is working towards closer cooperation with the United States and China. European leaders were invited to the forum as honored guests, but the presence of China’s President Hu Jintao was a stark reminder of Russia's increasingly close ties with its neighbors to the east – as difficult as those relations remain. "The global financial crisis created big financial imbalances in a number of countries, including in Europe and the U.S.A. New 'bubbles' can form in almost any market, as we have seen clearly, and with the global financial system the way it is, when they break, the whole world feels the effects," Medvedev said in his keynote speech. "There can be no doubt as to Russia's continued integration into the global economy. We have no choice here." While closer integration with Europe, which is by far Russia's largest trade partner, remains important, Medvedev emphasized that joining the WTO is Russia’s top priority for external trade relations. "I think we can realistically complete the process [of joining the WTO] by the end of the year, if, of course, political games do not start up again," Medvedev said. Medvedev blamed these "political games" for Russia’s long delay in joining the global trade club, but also took a sideways swipe at the European Union for playing similar games, particularly on easing visa requirements. "We seek to introduce visa-free travel with the European Union and other countries, but much here depends on our partners. We are ready to demonstrate our good will on this matter by taking concrete steps," said Medvedev. The visa question has become a sticking point in further developing ties between Russia and the EU, and was largely responsible for the lack of any results at the Russia-EU summit in Nizhny Novgorod on June 9-10, where WTO accession and visa requirements topped the agenda. The two sides are so far apart on the visa question that they can't even agree on a date to start the discussion on what to do: The deadline to start talking about action on introducing a visa-free regime between Russia and the EU was delayed again to the end of July. Nor was there any movement on Russia's membership of the World Trade Organization, which is a pre-condition to starting talks on a badly needed new Russia-EU basic agreement. Without agreements with the EU, Russia’s prospects for acceding to the WTO before the end of this year look less likely, despite the palpable optimism of both the Kremlin and commentators. And little progress was made in the Partnership for Modernisation; the European Investment Bank and Russia’s state-owned Vneshekonombank only signed a memorandum of understanding to mutually consider funding projects that are part of this program with up to €500 million coming from each side. Indeed, the lack of progress in visa talks with the EU was thrown into relief by an announcement on the first day of the St. Petersburg Forum by U.S. Ambassador to Russia John Beyrle. The American diplomat declared that a new agreement to give citizens of Russia and the United States three-year multiple-entry visas had been agreed upon – a significant easing of rules and a significant gesture. "Three years is just the first step," Beyrle promised a packed room of delegates.